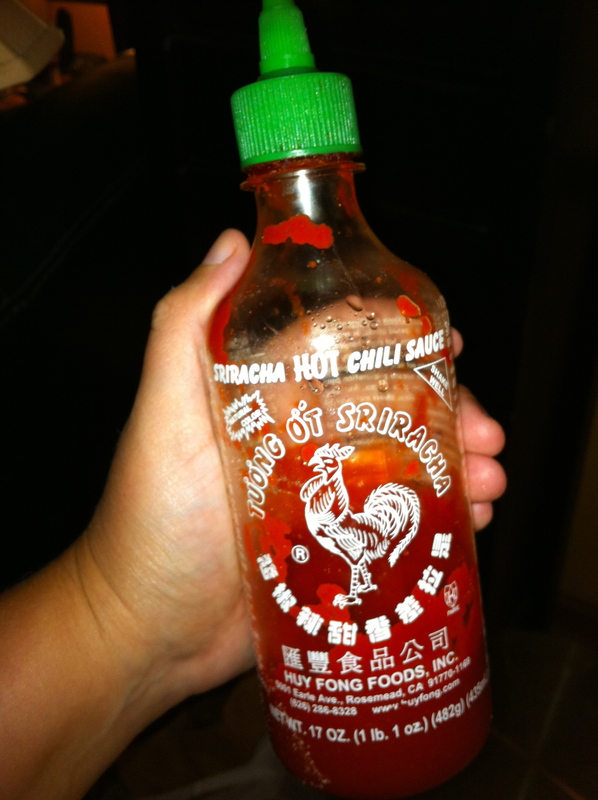 An Ode, Of Sorts, To Sriracha | DidjaEat? I’m sure you’ve probably seen this bottle before (usually without the ham hand holding it). People have all sorts of names for it: “fire sauce”, “rooster sauce” (courtesy of Matt), “crazy hot sauce” and the actual name “Sriracha”. While it used to just appear on tables in hipster eateries, southeast asian places and, well, that was it, it now appears anywhere good food appears. Sriracha is a Thai chili sauce involving, but not limited to sun-ripened chilis and garlic ground into a paste. Or, as I call it: fantastic-ness. Let’s back it up a second and we can talk about my relationship with Sriracha. I am, and have always been, a fan of hot sauce. Wings? More hot sauce please! Chili? Make it hotter please! I used to use Sriracha all the time and then kind of forgot about it until I was at a bar one nite and saw it sitting in the collection of condiments. Forgetting how HOT this stuff is, I proceeded to cover my fries with the stuff, while proclaiming to the bartender how much I missed Sriracha and love it. The bartender looked at me like I just proclaimed myself “king of the ant people, Ma!”. She also started filling up a water glass for me. One bite and I remembered exactly how hot this stuff is, but being a hard headed Polock, I was going to finish my meal because money does not grow on trees (as was screamed at me constantly as a kid). Hours later, when the firey heat in my fingers and mouth went away and I stopped all the eye watering, I was making plans on picking up a bottle to keep in the fridge. I enjoy regular hot sauces, like Frank’s Red Hot (and the wing kind as well) as well as Crystal Hot Sauce and most other hot sauces. The problem I have is the absolute ridiculous abundance of salt that is in the recipes of these sauces. When I am done eating whatever I have just slathered the sauce all over, I need to drink a bathtub amount of water in order to not dry up like a slug drenched in, yes, salt. I hate that feeling of being dehydrated as much as the feeling of low blood sugar. I also can’t really eat peppers anymore also because the seeds turn my body into a festival of terror. Ahem…moving on….. This is where Sriracha really shines. I’m sure there must be some kind of salt in there, but not nearly as much as the above mentioned sauces. You only need a little bit and it really mixes with other condiments nicely (for example, my new favorite dip is sour cream and Sriracha. Mix and chill and it is delicious with crackers or whatever you’d like). Plus! No seeds! I tend to put it on everything. Chicken? Dip it! Chili? Add some! Spaghetti Sauce? A few drops will perk it up! Put some in cocktail sauce. Mix some mayo with it and dip your fries in it! Making Buffalo Chicken dip? Meatloaf? Go for it! The list goes on and on. The heat goes on, but if used in small amounts, can bring a recipe alive! If you really like heat, use a lot and rock on my friend! As you can see from that picture, my bottle is running really low. This really makes me nervous, but have no fear, I am on it! My local Shoprite now carries it, and so does any store with an international aisle. Go grab a bottle and keep it in the fridge and experiment. Your food doesn’t have to be on fire, like I like it, but it can come alive with a little bit of heat to make a boring meal more interesting. Posted on September 6, 2010, in condiments, home cooking and tagged rooster sauce, sriracha. Bookmark the permalink. 2 Comments. You can also use it to make a homemade version of the spicy orange sauce served at sushi restaurants. I used this recipe for a recent make-your-own sushi party, and everyone agreed it was an almost perfect rendition of the original. I thought it was a tad spicier than normal, but otherwise very good. I will try that! Thanks! !